Rishi Kapoor's message to PEMRA has a point. On October 19, Pakistan Electronic Media Regulatory Authority (Pemra) declared a blanket ban on Indian content being aired on Pakistani TV channels. The ban, which came into effect on October 21, was in response to India banning Pakistani TV content in the country amid the ongoing tension between the two nations. Veteran actor Rishi Kapoor, who’s an active tweeter, shared his opinion on the same in a series of tweets suggesting that the ban of movies and shows in both the countries is a wrong move because people will manage to watch their favourites through “illegal” means no matter what. “Think. Pemra (Pakistan), you banned Indian content on your channels and theaters. Can you put stop the selling of illegal DVDs of Indian films?The fight is between politicians and governments. Putting a ban on matters of heart is wrong. We fight a similar fight here. Just chill,” he wrote in Hindi. Not just that, he also talked about the economic loss of the ban which will be incurred by the entertainment industry in Pakistan. “PEMRA. Pakistan has around 85/100 multiplexes and if they don’t have content to exhibit think how much of loss incurred? Why punish them? Can understand your knee jerk reaction of banning Indian content. The truth is that both the countries are illegally watching. Think about it. lol,” he tweeted. Think. PEMRA(Pakistan) Bandh karwaya Indian content Apne channels Aur theatres mein! Zara bandh kar ke dikha illegal DVD’s Indian films ke? PEMRA. Pakistan has around 85/100 multiplexes and if they don’t have content to exhibit think how much of loss incurred? Why punish them? Interestingly, @chintskap received a massive response from the other side and they all seem to agree with him. Exactly, we both have the same jhagda. The issue is politics both sides. 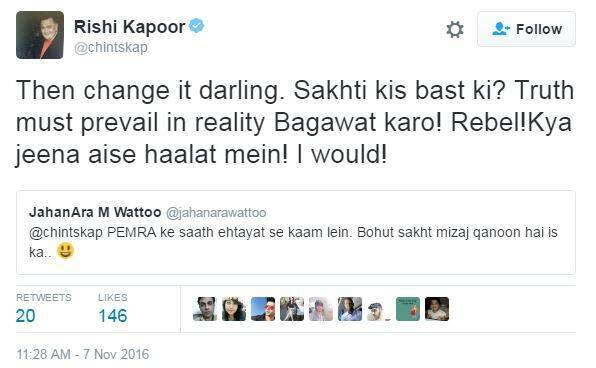 Kapoor’s response to a user who said PEMRA is very strict was indeed the best thought. “Bagawat karo! Rebel!Kya jeena aise haalat mein!” he wrote. Have something to add to the story? Tell us in the comments below.